Higgledy Flower School 2016. #5. Half Hardy Annual Flowers. If you can throw your minds back to the distant hours of yesterday tea time…you will recall being on the edge of your seats as we learned the fundamentals of growing Hardy Annuals in the cutting patch. Naturally I had some concerns about following that most juicy of topics up with another roller coaster ride of high energy floral knowledge without there being some sort of a gap to allow you to catch your breath or have a brandy. However…with due consideration I think we throw caution to the wind and brace ourselves for the danger and the glory that make up the ever eventful world of growing Half Hardy Annual Flowers. What are Half Hardy Annual Flowers? Half-hardy annuals such as Cosmos, Rudbeckia and Nicotiana die if exposed to the cold, so they can’t go into the garden until after the last frost. Generally these flowers will be native to somewhere more toasty than the UK where they can lounge about at their leisure setting seed more or less when they like due to the lack of seasons. Here in the UK we are big into seasons and any guest plants have to tow the party line. This often means starting the seeds off in pots. Tips For Growing Half Hardy Annual Flowers. *Most Half Hardies can be sown outside as long as you wait until after the frosts…usually about mid May. 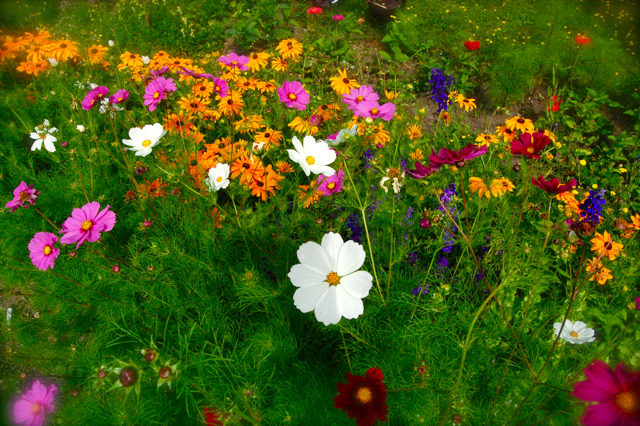 Follow the same rules as we looked at yesterday for Hardy Annuals….only the timing of the sowing changes. Link To: The Hub Page Where You Will Find All The Lessons For The 2016 Season. *Some folk (myself included) get better results if we sow in pots from early April and then plant out the seedlings/plantlets after mid May. I use 3 inch square pots…15 sit nicely in a standard seed tray and the pesky slugs find it difficult to hide anywhere between the pots.Its easy to assume that sowing in pots is much more work…but its not the case…when direct sowing you will spend much longer weeding around tiny seedlings a few weeks after sowing. Weeding a bed with nothing in it that you wish to keep, before then planting seedlings, is a very quick process. Both methods probably take a similar amount of time to achieve good results this time is spent at different stages of the season. 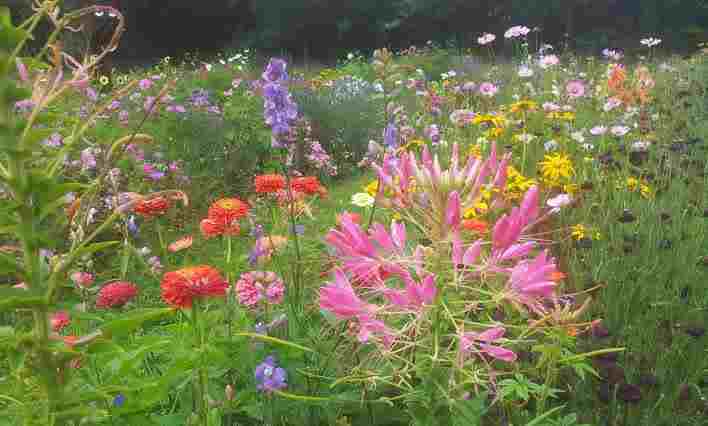 Which Half Hardy Annual Flowers To Grow In The Cutting Patch? Here is a link to the selection of Half Hardy Annuals that I stock in the shop and grow in the Higgledy Garden. Here’s a few Half Hardy Annuals that I don’t like being without. 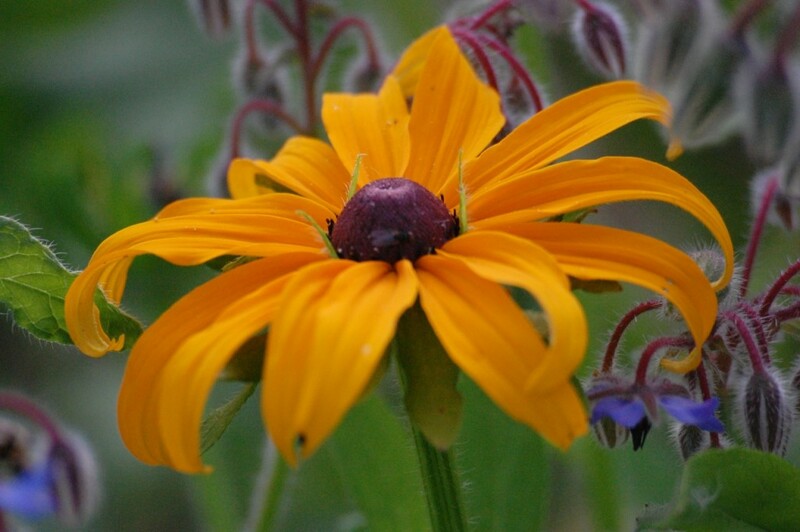 *Rudbeckia. Some people don’t like yellow flowers…I think this strange opinion became widespread in the 70’s…if you don’t find Rudbeckia attractive then your retina have probably fallen out. 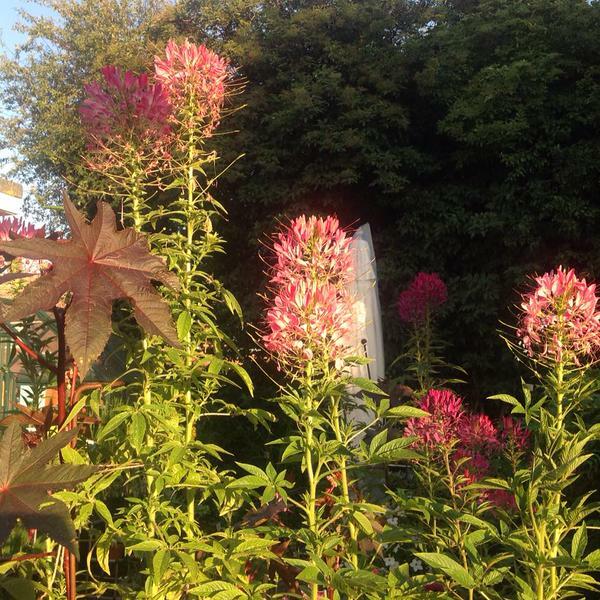 *Cleome. These are wayward beauties…exotic…a little bit excitable…they always come across as having had a couple of Lambrinis over the odds. They are best surface sown in pots…I keep a sheet of newspaper over the seed tray to keep the moisture in while still letting some light in….give them plenty of time to germinate…once they get going they will rock out for Jesus. 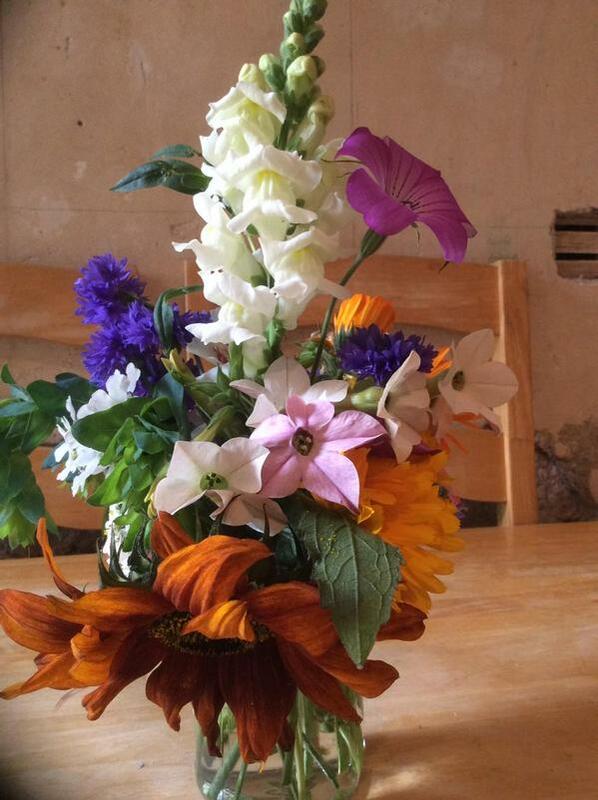 From the delightful @spookychews…a wonderful vase which has some rather dashing looking Nicotiana ‘Sensation’ in it. (in the middle) #Cracking! *Nicotiana. Flowering tobacco. Another one to surface sow…sow REALLY thinly…the seeds are the finest powder known to modern man. These flowers will release their scent in the evening…I grow some under my windows and it fills the cottage with headyness. *Helianthus. Sunflowers. 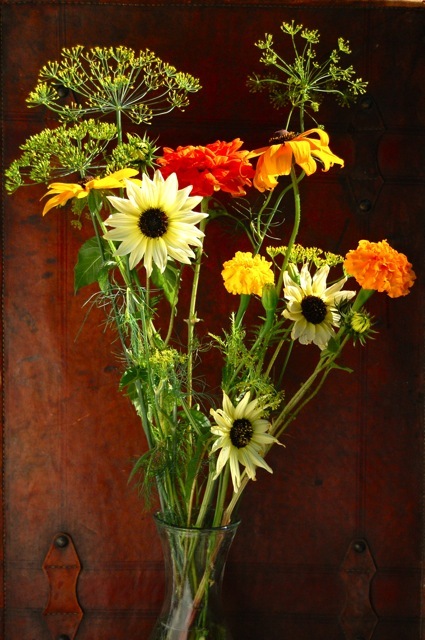 We don’t want big dustbin sized flowers in the cutting garden…we want branching stems varieties with plenty of bloom. ‘Vanilla Ice’ was my best seller this year…it’s a cracker. 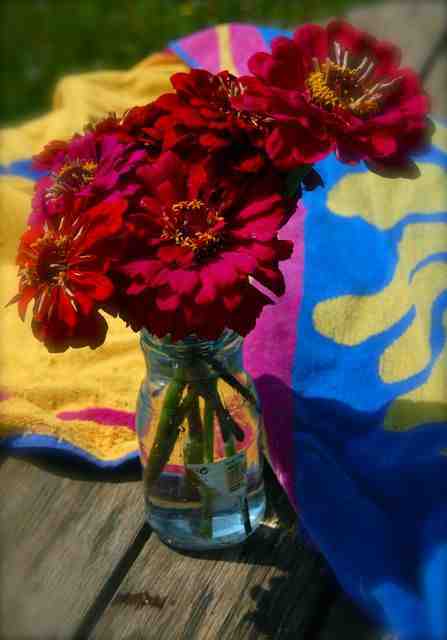 *Zinnia. Mexican Sunflower. More exotic vibes from these beasties…grown correctly they will be super productive…they have a quirky edge with the new vanguard of British floristry loves. All of these can of course be found in the Higgledy Garden Seed Shop. Your Half Hardy Annuals should flower from July, right through until the November frosts. Enjoy the weekend. We will be back in class for tea time on Monday…exploring the possibilities, dangers and temptations of growing a dedicated bed of Biennial Flowers. Link to: Higgledy Christmas Gifts. If you have any questions then please ask away…you can find me on TwitterorFacebook.Should you wish you can join ‘Club Higgledy’ (see the right hand side bar). Hardy Annual Flowers. Biennial Flowers.